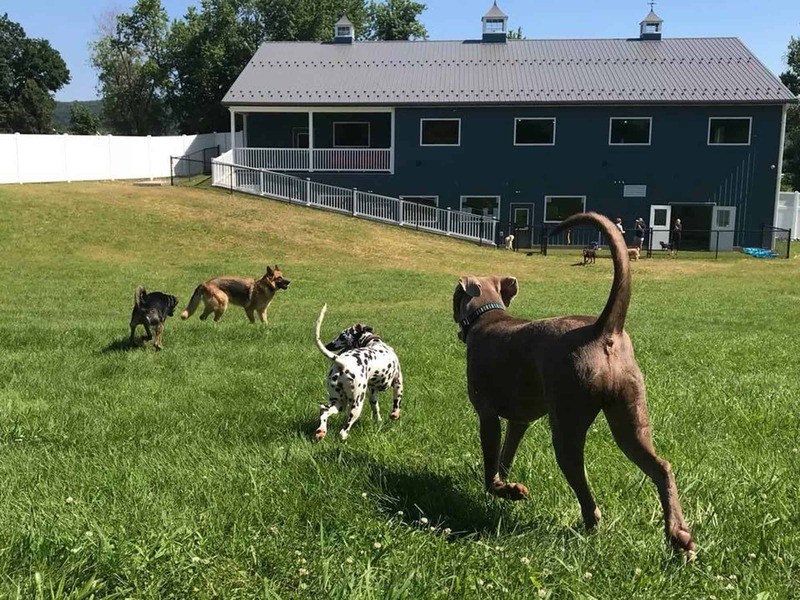 The newest Greenlin Pet Resort on Lambs Gap Road in Mechanicsburg, PA offers the luxury and amenities all good pets deserve. The upscale resort for dogs and cats is a two-story facility. The main floor includes a reception area and a spacious exercise space. The daylight basement features an indoor pool, wash room, and sleeping quarters. The basement also has access to a grassy play area where pets can frolic after a swim or bath. It’s one of three pet resorts owned by Doug, his wife, Steph, and their daughter Jenn. Doug and Jenn had three main requests for the project: sound retention, durability, and an upscale feel. “Quarry View was creative and used materials I had never thought of using for soundproofing and sound-deadening,” Doug said. The end result? A quiet environment that keeps pets comfortable and a quiet building that doesn’t disturb the neighborhood. The owners wanted a barn-style building instead of a commercial look. We used stick frame construction, exterior metal roofing and siding, and a poured-concrete foundation. Dutch doors on the sides, a 5:12 pitch A-frame roof, and beautiful cupolas lend the look and feel of a barn, with the utility of a commercial facility. Wood fencing provides privacy while keeping with the aesthetics of the resort. Doug chose us as their builder after we renovated a building for him. The Lambs Gap location opened in July 2018, and Quarry View is already on to the next project with Doug and his family. We’re learning his business together, and we understand what he’s trying to achieve. For Doug, it’s important not to reinvent the wheel every time we start a new project. For us, it’s about trying to understand what makes their lives easier and their business better. As with all our customers, we enjoy and value our ongoing relationship with Doug and his family. We believe these relationships make us stand out from the competition. Our goal is to leave customers not just satisfied, but excited. It comes down to the basics of treating people well and going the extra mile. We felt the same way. We loved working with Doug, Steph, and Jenn and are honored they chose us to help them with this very important aspect of their business. At Quarry View, we strive to make the building process an enjoyable one for our customers. If you’re looking for more than a building, if you’re looking for a great experience, contact us today to get your project started.